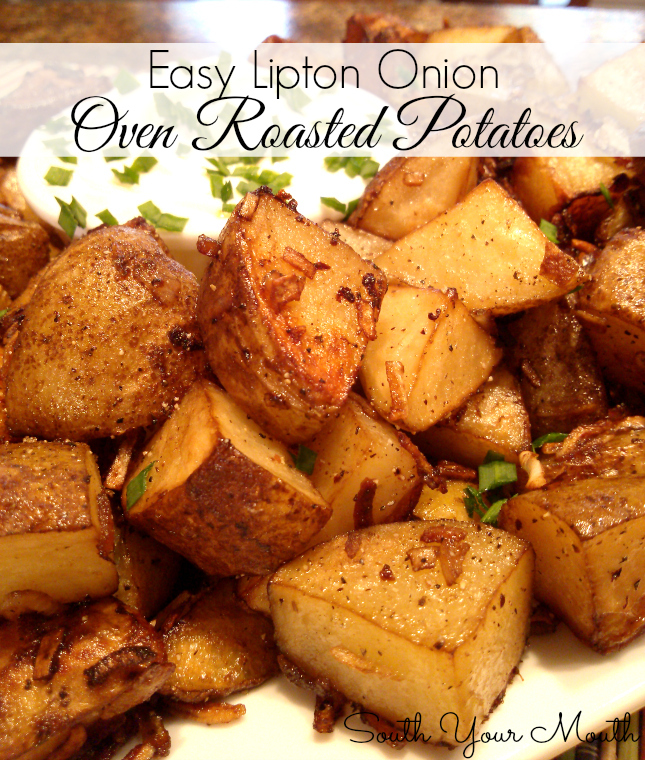 Easy recipe for oven roasted potatoes seasoned with Lipton onion soup mix. I had these a few months back at my friend, Sandy’s house. I’d forgotten how simple and delicious these potatoes were! Not long after, I picked up a box of onion soup mix to have on-hand the next time I had potatoes laying around. Which isn't often because all I ever cook is rice. Bless my poor meat-and-potatoes husband’s heart. Anyway, I’d bought some to make the Smothered Chicken & Potato Casserole and had enough left over to make these. I know it seems odd to most of you that having potatoes around the house is a rarity for me. But you underestimate how much I love rice. Obsessed might be a better word. Anywho, this recipe has been around for eons. You know why? Because it’s GOOD. In case you need a reminder or a recipe to go by, here’s how I made mine. Wash potatoes and cut into 1-inch pieces, leaving the skin on. Add potatoes, soup mixes and olive oil to a large bowl and toss to coat. Spray a large baking sheet with cooking spray then arrange potatoes in a single layer. Use two pans if you have to – don’t crowd these or layer or they’ll steam and get mushy. Top potatoes with any oil/soup mix left in the bowl. Once arranged on the baking sheet, season potatoes with black pepper and garlic to taste. Bake at 425 degrees for 35-45 minutes or until gold brown and crispy, flipping once with a sturdy spatula halfway through cooking. I say use a sturdy spatula because the potatoes may stick to the bottom of the pan and you'll need to scrape them off so the potatoes and skins stay intact. Serve with sour cream and chives or good ol’ ketchup. Instead of olive oil I use ranch dressing. Yum! Very good recipe! Thank you.